A house for the mural at the Basalt Art Base created by the dreamers. Jaciel's self portrait in progress on November 2 at the Basalt Art Base. Leticia Ingram holds up various props to quiz her students on their English at the Basalt Art Base. Art Installer Bill Poague hanging up the students' mural at the Art Base on November 9. Ruth and Alex work on their self portrait portion for the mural at the Art Base on November 2. Art Installer Bill Poague hanging up the student's mural at the Art Base on November 9. Students working on their self portraits for the mural on November 2 at the Basalt Art Base. Dreamer students working on their mural at the Basalt Art Base on October 19. 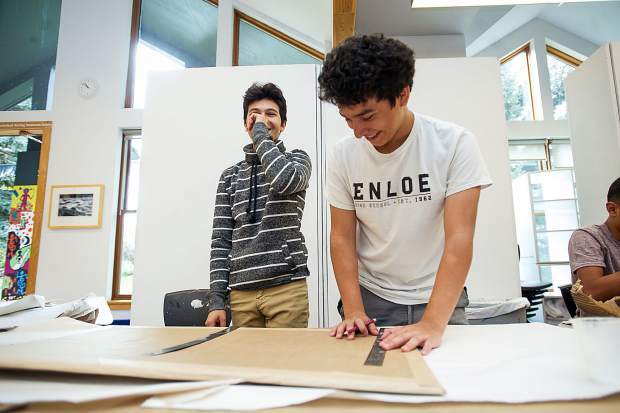 Ulysses, right, and Jaciel have a laugh while working on their Basalt Art Base mural on October 6. Andres, and Artist/sculptor Ajax Axe working on the mural at the Basalt Art Base on October 6. 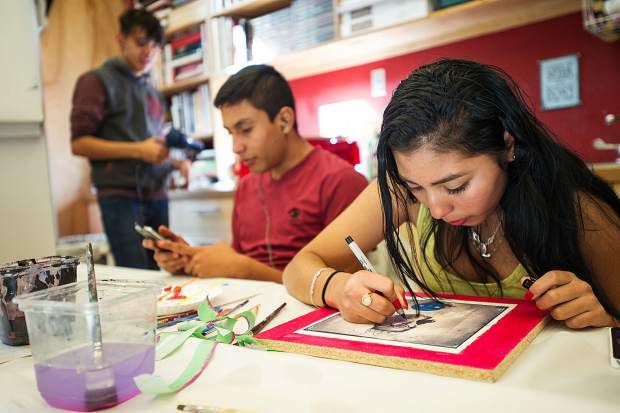 To the rhythm of El Salvadorian trap music blaring from cellphone speakers, amid a din of conversation in Spanish and some English, with the smell of paint and glue in the air along with constant titters and laughter, a group of the Roaring Fork Valley’s newest immigrants were making a home at the Art Base in Basalt. 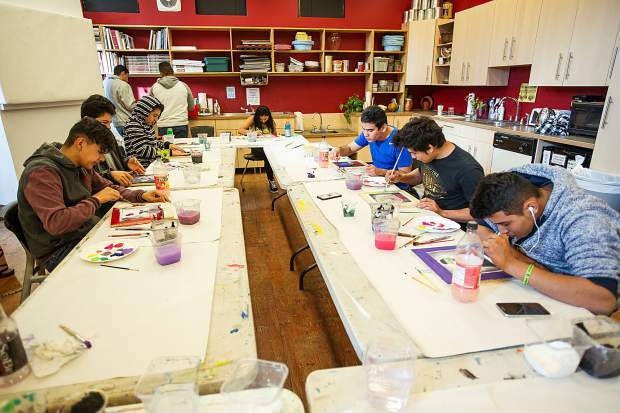 An innovative effort to foster community through art, welcome these newcomers to the valley and build bridges between the midvalley’s Spanish- and English-speaking residents, “Home” opened at the Art Base in early November. The wider valley community has since begun adding to the mural and collaborating with these teens. Anyone can add brushstrokes or drawings to it through Dec. 22. Most of the kids had never been enrolled in an art class before this one. 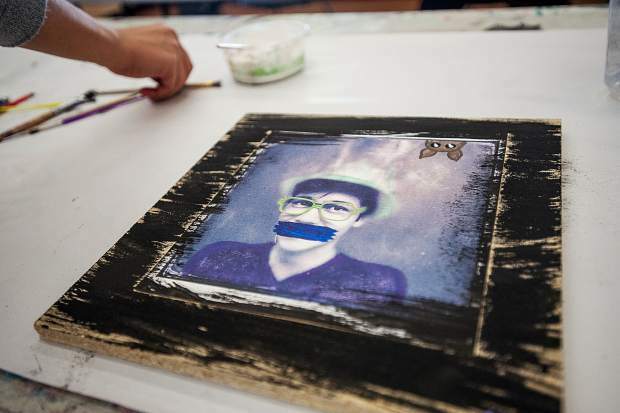 But working with local artist Ajax Axe and the award-winning Basalt High teacher Leticia Guzman Ingram, they quickly began taking pride in their artwork. The students first entered the Art Base in mid-September and returned for morning-long art-making sessions twice a week through November. The process began with a dialogue about the meaning of “home,” about where they’d come from and how they were making Basalt their home. Most of the students crossed the Mexican-American border on their own and are beginning their lives in Basalt without their parents, who spent what they could save to get their children to the U.S.
“Their families are counting on these kids having better opportunities and helping their families by being here,” Axe said. In early October, they began designing their houses for the mural. 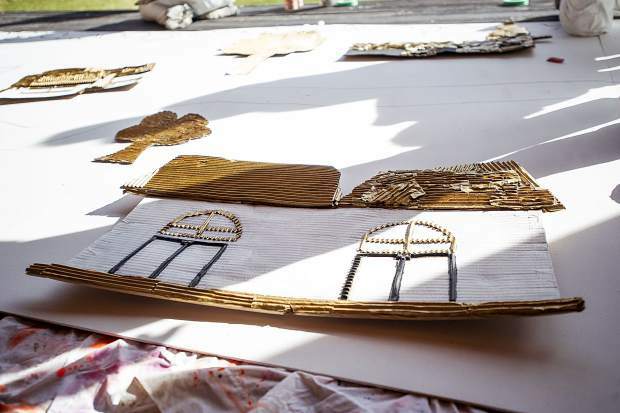 They constructed them out of cardboard and painted them in black, gold and white. Some imagined space-age home creations. Others, like Jaciel — a 16-year-old from Chalchihuites, Mexico — replicated the houses they’d lived in back home before immigrating to the U.S.
“This is a great way to express their feelings without necessarily vocalizing them,” Ingram said one October morning as the students chipped away at their homes. The kids then began integrating their ideas of community into the work, talking about and designing the village where they’d want their homes to be. This ideal place, now in the mural spread across three adjoining walls in the Art Base’s gallery, ended up looking a lot like Basalt and the Roaring Fork Valley: it is bisected by a winding river, with mountains on the horizon and a gondola overhead, along with pine trees and — in a Central American touch — palm trees, as well. They made the mural in simple black-and-white outlines. 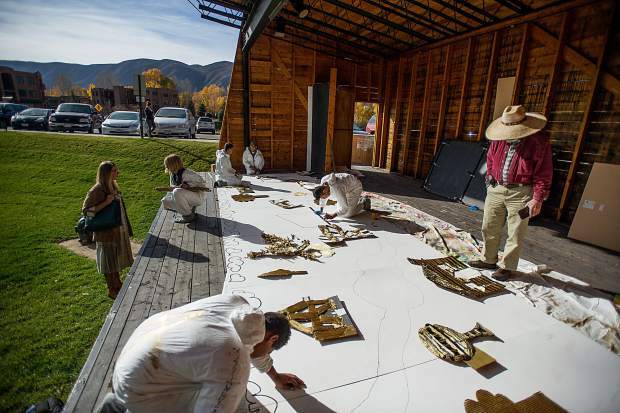 Beginning at the exhibition opening Nov. 10, the Art Base invited the larger Roaring Fork Valley community to collaborate with these students by filling it in with teal, gray and purple paint. Brushes and paint are on-hand for anyone to continue that process. The exhibition also has markers available and instructions inviting viewers to draw themselves into the mural. 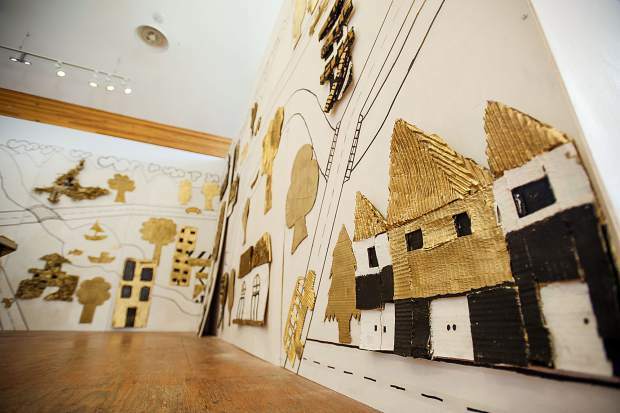 As the students built their miniature homes for the mural this fall, they also began to tell their stories inside those homes. Axe photographed a portrait of each of her students and then had them draw and paint on top of that portrait. Ruth, 15, who arrived in late October and joined the English Language Development class as its only girl, painted a crown and eyeglasses and bright red lipstick on her self-portrait. She crossed the border in September, making her way from Usultan, El Salvador, to join her father and siblings in Basalt. 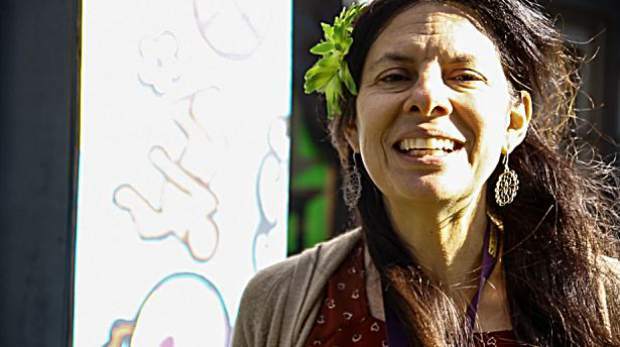 She quickly fell under the spell of creativity while working on the mural and discovered a passion for art, signing up for additional classes at the Art Base as the mural project neared its end. The students pasted the portraits inside their houses on hinged panels. Hung on the mural, viewers can open them and meet the artists. Ingram and Axe also had the students write answers — in both English and Spanish — to a series of questions about themselves and their homes beside their portraits. In these testimonials, they give their name and age, their hometown and what they miss about it, along with what they like about Basalt, and why they selected their chosen design for their mural house. 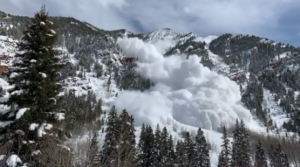 Finally, they say what they want the Roaring Fork Valley community to know about them. “Part of the point of this project was to introduce these kids to the community and let them speak directly to the community,” Axe explained. Most say in their testimonials that they miss their families. 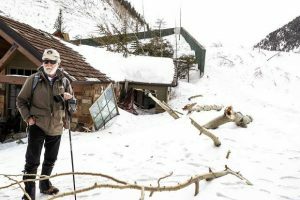 Others say they miss their beds and the houses they left behind. One student, Alex, 16, who arrived in Basalt in August, said he missed his family’s horses, roosters and farm animals at home in Santa Clara, Mexico. The students’ stories are diverse and often confound stereotypical notions and narratives of Dreamers and new immigrants. 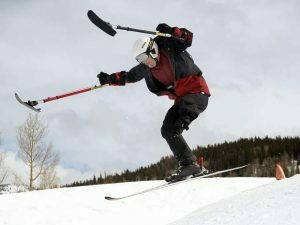 Alex, for instance, was born at Aspen Valley Hospital. His father had health issues, however, and needed a kidney transplant when Alex was a toddler. Ineligible for a donated organ because of his immigration status, Alex’s father went back to Mexico with his family and his 4-year-old American son. He did receive the transplant in Guadalajara, Alex said. Eleven years later, he sent the boy back to his birthplace where Alex is now learning the language and culture of America for the first time. Three of the students attended the art opening with their families. Most of them work nights and weekends. 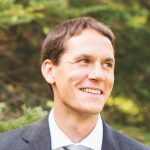 Ingram said those obligations can serve to further isolate new immigrants in Basalt, making it difficult for them to partake in after-school sports or clubs or socializing. Many of the boys in Ingram’s class expressed hope that they might be able to join the soccer team later in high school. So this art project, Ingram noted, provided an outlet beyond academics for the kids and is a key part of the social-emotional learning that she emphasizes in the English Language Development program. Some also discovered talents they didn’t know they had. One student, Jason, took a particular interest in calligraphy and took the initiative to create the large-scale lettering for the show’s title sign — in both English and Spanish — working meticulously with drafting tools as the date of the opening neared. By early November, the students felt at home making art. Their houses were all on drying racks and they’d moved on to their self-portraits. The art project that would become “Home” is also just a part of the comprehensive English Language Development program that Ingram runs at Basalt High. With her immersive approach to teaching English language skills to Spanish-speaking newcomers to the school, most kids advance to the next level of English instruction after three months. “When I first started working with them, I realized that they were really nervous to do anything, especially to go out in the community and speak English,” Ingram recalled. So she started bringing them into the valley community wherever she could. She’d go to grocery stores and give them assignments to find certain foods, interacting with clerks speaking English; at Alpine Bank, tellers help them learn to do banking in English; and at Valley View Hospital they talk to doctors and nurses. 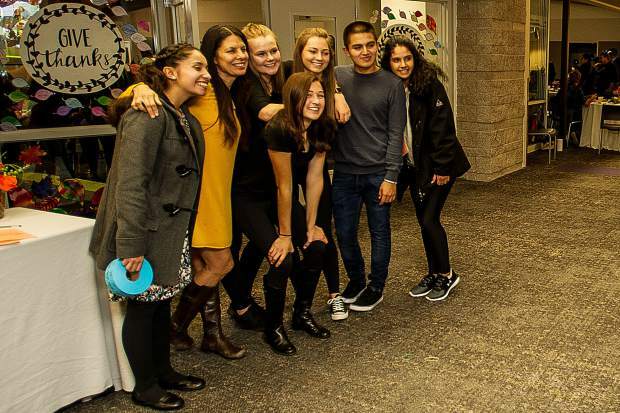 Ingram also spearheaded the school’s annual Thanksgiving feast, aimed at integrating new immigrants into the community and introducing them to the American tradition of Día de Acción de Gracias. After five years, the Thanksgiving meal has become a beloved local tradition, drawing hundreds of Spanish and English speakers alike. 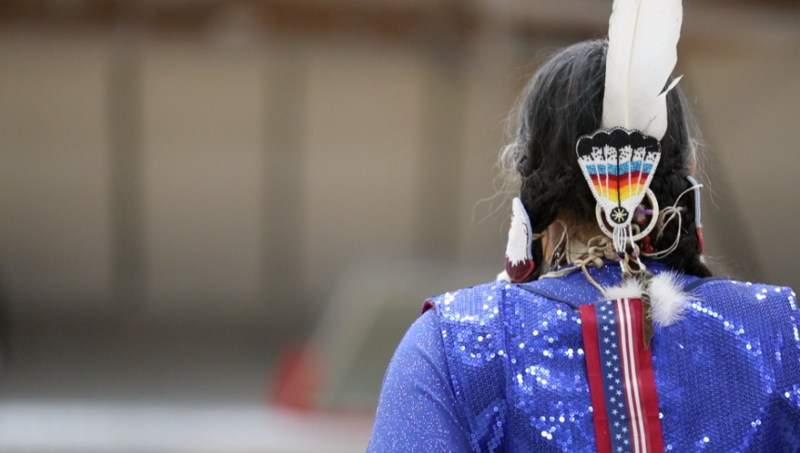 “As much as it’s about language, it’s about introducing them to the community and the culture,” Ingram said at this year’s dinner in mid-November. The high school has three teachers devoted to English Language Development, and others who teach them math and social studies. Basalt High’s program offers a more personal brand of teaching than most. As the Thanksgiving event approached, for instance, Ingram and other teachers personally went and knocked on the doors of more than 90 homes of English Language Development students to invite them to the dinner. When Basalt got its first snowstorm in October, the newest students had their first experience in the snow — and had their first snowball fight at the Art Base — but it made clear most didn’t have winter coats, hats or gloves. Axe took up a collection from her friends and brought bags of gear to outfit the students. By the time the exhibition opened Nov. 10, most of the kids listed snow among their favorite things about Basalt. Tim McNulty teaches second- and third-year English Language Development students. This year, he added a class the school is calling “Creative Expressions,” a writing class aimed at encouraging immigrant students to tell their own stories. 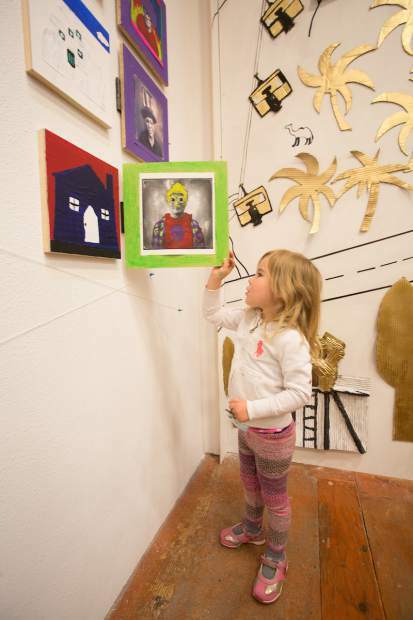 Like the Art Base collaboration, it offers the kids the chance to empower themselves through self-expression. The storytelling practice, McNulty noted, is not only important for language skills but for social-emotional development. It might take years before an immigrant kid is comfortable sharing what it felt like to leave home and end up in Basalt and detail the trauma along the way. He recalled one student from Honduras whose father was caught crossing the border, leaving her completely alone on the rest of the journey. “Once she could talk about it, it helped the healing process,” he said. Basalt High graduate and former English Language Development student Karina Rivas spoke of the immense influence and dedication of her teachers in an address to the crowd at Thanksgiving. Rivas is now in her second year at the University of Phoenix on a full scholarship through the online college’s Teaching It Forward program. The full ride is given annually to each state’s Teacher of the Year honoree, to bestow upon a deserving student. Ingram won Colorado’s Teacher of the Year prize in 2015 and gifted her Teaching It Forward scholarship to Rivas. Rivas came to the U.S. fleeing gang violence in El Salvador. While she was at Basalt High, she juggled academics with two jobs but still excelled. She used her Thanksgiving address not to speak about her accomplishments, but instead to honor the teachers who welcomed her at Basalt High. 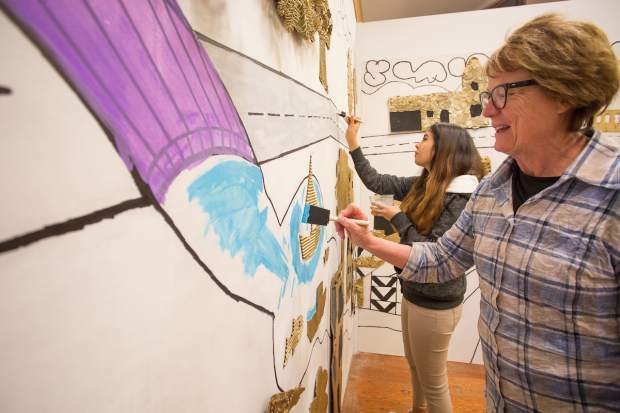 The “Home” mural project is the first in what Art Base executive director Genna Moe says will be an annual tradition of working with Basalt High’s English Language Development students on a year-end show in November and December. 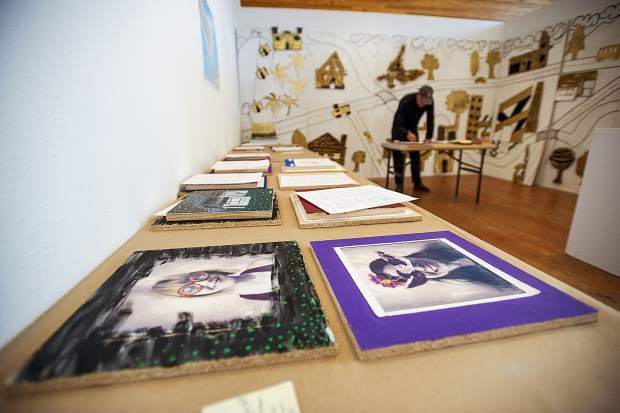 The nonprofit gallery and cultural center — formerly known as the Wyly Art Center — had in recent years been hosting a community exhibition called The Wyly Open. Last year, Moe and her exhibitions committee decided to discontinue the open format and to launch a new community show. At the same time, Moe was mulling ways to better integrate the midvalley’s Latino population — which makes up more than 50 percent of Basalt’s schoolchildren — into the Art Base. President Donald Trump’s anti-immigrant rhetoric and policies also played a role in the decision. “I was feeling sick about all the things that were happening in the political landscape and thinking about how we could bring greater visibility to this part of the community,” Moe recalled. 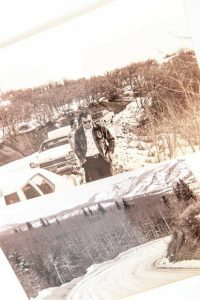 George Stranahan — the local icon, photographer, entrepreneur and Art Base supporter — suggested Moe talk to Ingram last summer. 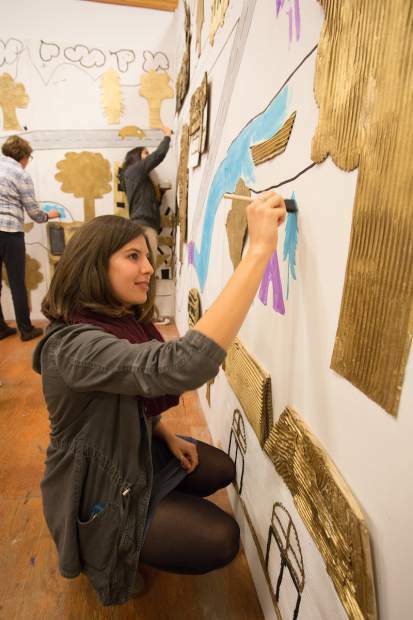 When the pair met, the idea to bring the English Language Development students into the Art Base and make a mural exploring ideas of home quickly took shape. Moe knew Ajax Axe’s work and knew she was a fluent Spanish speaker, so she brought her on board to lead the students through the process. Most anybody who knows Ajax Axe’s artwork would be hard-pressed to think of her as an authority figure — if anything, she’s a proud anti-authority figure. But she was an ideal fit for this group and for getting a rambunctious group of mostly teenage boys excited about making art for the first time. Her sessions at the Art Base were driven by a sense of creative freedom where music, experimentation, conversation and laughter were encouraged. One day she brought in a yoga instructor to introduce the students to yoga. Subtly and gradually, the kids found joy in making art and discovered the power of self-expression. At the opening, the student artists practiced their English with a crowd that came to see their work. Children and grown-ups drew on the mural and painted between the lines that the English Language Development students had drawn. 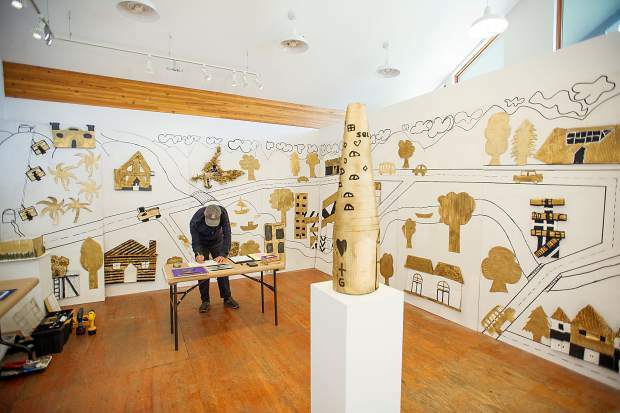 Locals, retired Pitkin County Sheriff Bob Braudis among them, wrote notes about their own definitions of “home” and stuck them on a gallery wall.